This stuff is amazing! I've been using it only a week and a half and three people have complimented me on my skin. I have suffered with acne for over half of my life and this is really making a difference with the scarring. I LOVE it! After 2 days of use people from work started saying that I looked glowing and rested and mums outside the school gates asking me if I was on a holiday. My skin looks amazing and there’s no hiding it! To start with I used it too often and had a painful reaction and shredding, but it improved after a few days. I use it every 3-4 days now and am very happy. Highly recommended. I bought a sample of this over a year ago and at 33 noticed fine lines on my forehead. The sample size sorted them out. Now after a year of bad diet and bad skin care I decided to go back in and purchased full size. This product really does work for me. However, I went a bit gung ho in the first week and used it three times, experienced red sore peely skin that only coconut oil could stand! So do build this up slowly! Going back to once a week, but my skin with this product is fabulous. I also used the ordinarys retinol and experienced absolutely no difference to my skin. I would definitely try the small sample size if you need convincing. Just need to save up for BHA next, another wonder lotion from Paula's Choice. Puppy - Simply the best! Have been using this product for some time now and I am delighted with the results, my brown spots have faded considerably and that was my main issue so thrilled I have found a product that lives up to it’s claims!! Will be purchasing again! This product is just amazing, it gas made a huge difference to my skin, I am so pleased with it. I have recommended it to my friends and bought it for my mum, who loves it! Everything I'd read about Retinol treatments left me convinced I would suffer red and inflamed skin but not with this. The expert advice about how to use the product really works and me skin does look plumper and better after three weeks. My brown spots are a bit less obvious I think and I've also been using it on the backs of my hands which have more brown spots on them then I'd like. A very good product and worth the money with a generous amount of retinol for the price. Pupp - Brilliant product after using for a while fades my brown spots perfectly! I first starting using this some time ago after seeing Wayne Goss praising it and boy is he right, using it steadily over time and following the instructions my pronounced brown spots have all but disappeared, I use other PC products in conjunction with this so working all together my skin is now looking as it should, now I wear sun screen every time I leave the house and If I am driving!! I was slightly nervous to first introduce retinol into my skin care regime. My skin is relatively clear now although I did have some acne marks/discolouring on my cheeks when I first started using this. 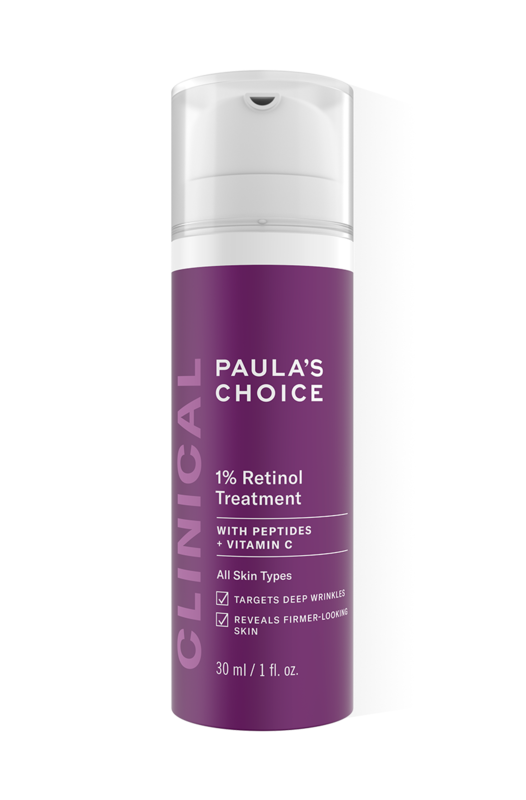 I have been using Paula’s Choice retinol for about 4 weeks now, I noticed a reduction in the marks on my cheeks from the first application! For the first 4 weeks I have been using this product every 3rd day(Monday-Thursday-Sunday etc) and I have had no adverse reaction at all, just amazing results! My skin has never looked so good! I’m now using this product every other night and the results just keep getting better. My skin has never looked better, my make up goes on looking completley flawless and I have found I have a natural glow to my skin. I have had no breakouts from this product. I’m 21 so I can’t really comment on how the product works on wrinkles and fine lines, I have just noticed a huge difference to my skin texture....it’s so smooth! Thank you Paula’s choice!! An excellent retinol product. Significantly cheaper than Dermalogica products I have tried, and good results within a fortnight. I've received a trial size of this as part of a deal when I spent over a certain. I have been using retinol for around a year now, starting with the barrier repair moisturiser, then layering the retinol serum on top at night. By this time I had built up a good tolerance to lower levels of retinol so fancied going all out with the stronger stuff! I use the 1% clinical after cleansing, toning and using the 5% AHA exfoliant, finishing with the barrier repair mixed with one pump of clinical. I was apprehensive at first that it would be all too much for my skin, but amazingly I have been able to use it every night with no side effects whatsoever! Moreover, my skin has never looked or felt better! It's so smooth, soft and clear. I will definitely be purchasing the full size and this goes to the top of my list of must haves! I'm on my 2nd bottle of this now and will no doubt be replacing it. My skin looks clearer, brighter and smoother-lines have softened. It won't happen overnight but it's worth the wait. I'm 59 and people often say I don't look it.Good luck! Jules - Persevere with this..it works! I am 41 with combination/oily skin. I was lucky at 19 to stumble across a Neutrogena product that happened to have Salicylic Acid in it. My skin was always smooth and clear. It was only years later after researching ingredients,that I realised that a BHA was particularly good for oily skin. When the product was discontinued when I was 33, I started my search for a good BHA product to replace it. I never succeeded. I discovered Paula's Choice nearly 2 years ago. I realised my skin was deteriorating and I searched online for products. I kept stumbling across Paula's reviews and was drawn to her no nonsense, honest style. I first used the 2% BHA liquid which I fell in love with and thus started my journey with Paula's products. At 40, my skin was beginning to change. As an ex smoker and sun worshipper my skin was grey, lined and lacklustre. I had particular problems with deep nasal labial lines, frown lines and noticeable crows feet and under eye wrinkles when my face was at rest! I was so depressed and feeling old. I jumped straight in with the BHA 2% solution, AHA 8% gel and a tester for this retinol product. The exfoliants are fantastic and change your skin instantly. The retinol product is strong! Don't expect a beautiful looking or smelling product, as it is neither. But that's not really important. Its light, non greasy and sets well into the skin. I could only use once a week at first and my skin is not sensitive in any way. But over 3 months I built it up to 3 times weekly. The improvement was slow, almost unnoticeable. My skin looked better but not in any particular way. I then decided to start a stronger prescription strength retinoid 1% gel. Again I worked this in slowly over a few months. I stopped the PC retinol during this time. There was irritation, but I took it slowly. If my skin became irritated I gave it a break for a couple of nights. After around 4 months, I could see some improvement, but very slight. I then reintroduced PC retinol on top of the retinoid. I felt I was missing out, as the product is packed with so many other antiaging ingredients that prescription retinoid doesn't have. At first I alternated from the prescription retinoid 1% and the Paula's Choice retinol and now use together. I respond to my skin and give it a break when it needs it. I don't use either on my neck or chest as I am too sensitive there. Work out whats best for your skin and how often you can tolerate it. So in conclusion. Its been 2 years, but I can honestly say my skin is massively improved. My advice is, have patience and don't give up. Retinol products take time and you have to be consistent. I use sunscreen every day without fail. I also introduced vitamin c and niacinamide serums from other lines. I am excited to see the release of the new PC vitamin c booster. Will be trying that, although it does seem pricey. In terms of the PC retinol, it does seem quite expensive. But it is packed with so many other anti-aging ingredients as well as the retinol, that I feel its worth it. Use the PC sales and discounts to your advantage. Full size lasts me around 3 and a half months, using a pea size amount on average about 4 nights a week. The packaging does not allow you to see when the product is finished, but has never been a real issue, as new orders come within a few days. Apologies for long review, but I wanted others to know how good this product is. Don't expect a miracle, but expect significant changes with time. My naso labial lines have all but disappeared. My frown lines are not as deep. I have no crows feet when my face is at rest (and have reduced when I smile). My undereye wrinkles are reduced, but am hoping for further improvement there. Overall my skin has less open pores, feels plumper, smoother and has that dewy effect I had when I was younger. Last year I was depressed and hated to put my make up on, as I felt it made me look older. My makeup glides on now. I'm getting my younger skin back. Stick with this product and with others in the line and your skin will change for the better! Amanda23 - Beats the competition! I am on my second jar of this stuff and I've no intention of running out it! Strong stuff? Yeah it is and that's why it works! By way of comparison, I tried a 2% retinoid from the Ordinary, it didn't work and was greasy as it contained glycerine. I don't use this retinol daily and when I do I add a facial oil to my moisturiser to avoid dryness. It took months to increase the frequency of use but it's worth the wait! A great anti aging product. This product takes patience - you can’t expect to just whack it on your face day one and not to find it a little tricky. This is a product i have built-up slowly, firstly I buffered with a hydrating serum and avoided acids, a couple of times a week. But now I can use it full strength every day and it has revolutionised my skin. I’m really glad I persevered! I have been using this for a few weeks now, and I can actually see a massive improvement in my skin, it is by far the best product I have ever used. After reading the reviews, I thought I would give this a go. Every other Paula's choice product has been fantastic and my skin has gone from permanent acne-prone (aged 43!!) to mostly smooth and clear with the odd hormonal breakout. I have tried using this twice now and each time my skin has reacted badly despite trying it for about two months at a time. By the end of the last time, my skin was coming off in strips, leaving red raw skin underneath and I was developing clusters of painful, itchy spots. I have stopped using it for two weeks and my skin has gone back to its clear happy self. Like some others, I had difficulty using this serum, which gave me an irritation rash within a week. My solution is to mix it with moisturiser. No more irritation and still works a treat. It might be even more effective if it is applied neat onto the skin, but that's not for me. I understand that retinol can be harsh but I specifically bought this retinol product as it claims to be formulated to minimise irritation. I do not have particularly sensitive skin but even after mixing a small about of the retinol cream with two parts moisturiser, two days later I had such horrible skin. My cheeks and eyes were very red and sore which left me looking very tired. The whole of my face was incredibly dry and scaly for ten days before returning back to normal. I am so disappointing because I really wanted this product to work for me especially as it claims to minimise any irritation caused by retinol. I would definitely not recommend this. Customer Care: Thank you for your review. We are sorry to hear of your experience with this product. Unfortunately not everyone can tolerate a higher concentration of retinol. Please contact our Customer Care team to discuss other options. Didn't work for me, was too strong gave me a rash and made me darker/discoloured my skin. I wouldn't recommend for people of colour. Customer Care: Thank you for your review. We are sorry to hear that this product did not work for you. Although this is not a common response, we do understand that each customer is uniquely different in how they will respond to products or ingredients. We believe that colour is not a skin type and that there is more to your reaction. Therefore, our team will be contacting you shortly to assist you further with finding an alternative product. I believe that many people can't tolerate retinol side effects so I started with the trial size. I built up my usage and have had no adverse effects and I actually use a total of 5 PC products with retinol in and none of them have caused irritation. This really does make a difference to the skin texture and appearance, with regular use, the lines that wanted to bed in around my mouth have reduced and my skin looks clear, clean and soft. You can use this up to the orbital bone, which I do. Although my under eye area has been transformed, my dark circles are noticeably lighter, my eye bags have almost vanished and the skin is line free and soft, I have no idea which retinol product is the culprit or if it's a combination effect as I also use other retinol products on my under eye area. All I know is that my husband notices the difference and I don't need to pile foundation, corrector, concealer and highlighter under my eyes anymore! FAB and will purchase the full size product irrespective of price! Though my skin is sensitive, I've not had a reaction to this serum. I built up using it with PC serums with lower amounts of serum and followed the guidelines. I bought this as a power couple with the face oil, and used together it has stopped any adverse reactions while dramatically improving the look of my forehead where the skin is sun damaged and has frown lines. Great work! (Just follow directions in building up to using it). Customer Care: Thank you for your review. We are very happy to hear that this wonderful product is indeed working for you and that you are following the directions. However, please be careful as products with high percentage retinol may cause a delayed response with some people. Nonetheless, we hope you enjoy it and all other PC products. I have ordered this retinol treatment in January(there was a deal), but didn't open it until March as was finishing my retinol product by other brand. Retinol 1% treatment didn't agree with my skin at all. I only used it twice a week and my skin was getting dryer and tighter. After 4th use I got a bad skin rash on my neck. I had to use hydrocortisone cream for 3 days to calm it down. This treatment is just too strong for me (age 35) and it's upsetting to spend a lot of money on the product which can't be used. This absolutely has worked for me. I introduced it very slowly and my skin when a bit nuts when I put it in too often or too much. A really small amount is all thats needed - more just increases the likihood of irritation. Took me about 6 months to work up to nightly application. Its not the be-all and end-all and has not eliminated the need for other products but its earned a nightly place in my routine that I would not be without. It is expensive but not too bad when compared with other similarly formulated retinols, particularly in the UK. Was sceptical about this product because I have quite sensitive skin but I am so glad I did. I love how my skin feels the next day after using this product at night. I am forever touching my face. My skin is the best it has ever been. I am glad I tried it and the other PC products I use. Love love love! Charlotte - THIS DOES WORK!! I've been a suffer of Acne for years and i'm now getting to the age where I'm also concerned about ageing.. I wanted something to help with both issues and this is it! This is such a well developed product, gentle but truly effective! You only need a little which is good as my only qualm with this product is the price! I know I know it's a well developed product so it shouldn't be cheap but for the average person it's quite a bit of expenditure and for a product this good you just want to continue to buy buy & buy again!! Marlene - Wouldn't be without it! I use this 1% Retinol Treatment on alternate nights mixed with a little Resist Super Antioxidant Serum and together they make my skin feel and look great. 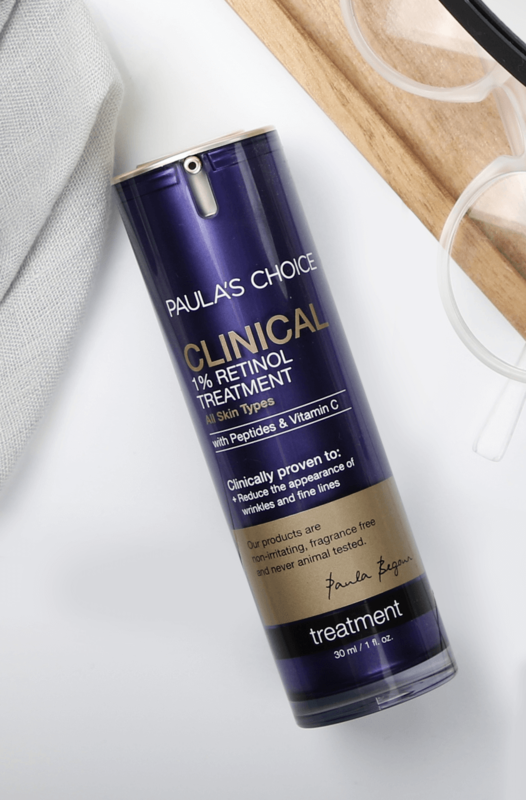 I initially started using this product on its own and apart from a little redness which was almost gone by the morning, as part of my Paula's Choice skincare regime, it helped my skin feel and look great. But I find mixing it with a couple of drops of Antioxidant Serum is the perfect combination for me. My skin has never looked and felt so good. I have used so many different brands of creams with retinol in the past and have given up using them after a couple of weeks - my skin would come out in red blotches, feel sore and generally look terrible. But not with this cream. A great product. I like this enough that I have ordered the larger size. The trial size is generous and used sparingly lasted me a month easy. It's pricey yes but I have just turned 30 and I am very aware that I need to start seriously looking at what anti-aging products I introduce into my skin regimen, so I'm happy to pay a little extra if I find "the one". Due to suffering with hormonal acne for the last 10+ years I have used lots of harsh treatments and face washes. I wanted something to reduce any accelerated aging effects I may have incurred as a result of these products. I feel I need to add that this isn't the same as an over the counter vitamine A product. I tried that after hearing rave reviews and was sorely disappointed. This however doesn't turn my skin pink or dry it out, or cause excessive peeling. I use it sparingly in my areas of concern Nasolabial folds, a little around eyes and on my forehead. I then just blend out the remains that I've pumped over the rest of my face. I apply at night only, and it's gentle enough for me to use every night since I introduced it slowly over the first week. It's not greasy or sticky and although I've yet to look 10 years younger it's brightened up my skin noticeably. I can't say if it's helped my breakouts yet as I've avoided applying it to those areas just yet. I can say it hasn't caused any new breakouts though which is reason enough for me to like it. This is very good, the results are noticeable very quickly. It goes on clear and doesn't leave any residue behind. I didn't get any irritation at all and I use it every day so for me it is really fantastic. The reason I have given it 3 stars is because the packaging is awful, the pump sometimes squirts a bit out and sometimes doesn't, and also the delivery is rubbish - four working days. On a product this price it just isn't good enough. My skin is very dry and can get red, especially in cold weather, so I was slightly daunted to begin using Clinical 1% in January. Following advice, I worked up to using Clinical 1% by first using the Resist Barrier Repair with Retinol for a few months (it contains much less retinol, I believe) so as to acclimatise my skin. 4 weeks into using Clinical 1% I have had a very small amount of 'shedding' more than 'peeling' and that was only for a few days and only for the first week. By now I am using Clinical 1% every other night without any unwelcome effects, and I must admit that my skin looks and feels way smoother than before. I don't know if this is even possible from a cream, but my skin appears tighter to me? Full disclosure; I use Paula's Choice C15 Serum, which I buy in USA, with this 1%, so maybe my results are a combination of these two products? Either way, the results have left me very pleased and impressed. Some small criticisms....it is way more than I would like to spend on any skincare product. The only reason I might not reorder it is the price, which is comparable to the (very similar) Skinceuticals 1.0. Secondly, the (very elegant) packaging makes it hard for me to know how much of the cream is left- the bottle is weighty, robust and (thankfully for the antioxidants!) opaque, so I suppose I have to guess when to reorder? Overall, a spectacular product with a hefty price tag! This company and especially this product is getting close to skincare perfection. For the quality of packaging and the percentage of retinol this product is brilliant. However, I disclude my exfoliant on the nights I use this just to safeguard against irritation. Since using PC products exclusively my dermatologist is starting to doubt if I have acne at all and I have suffered for years and years, there is real science backing up these products. I've used a 0.1% prescription cream in the past and granted it was achieving what I needed it to and I was noticing a difference (keep in mind I was using it for anti-ageing purposes, not acne), the recoil damage effect on my skin was both annoying and painful to deal with - high sensitivity, excessive peeling (I was moisturising with everything under the moon & more!) and overall extreme dryness. This gem right here, however, achieves the same results (have been using it for almost 4 weeks now, twice a week) with NO "side effects" whatsoever. -No sensitivity on the following day (or ever for that matter). My verdict: 5/5 stars, will be ordering again, I do recommend at least trying it out, if you're interested in anti-ageing. What to say except this is the game changer when it comes to stronger retinol it left me without redness peeling or breakouts unlike other products that have been at this high a percent . It's texture is unlike all the others in that it feels like a light serum/lotion it's like a lighter version of hydra light . I tend to put 2-3 small rice sized on the front of my hand then put it on my face bit by bit . And be persist and to get full results from a retinol product of 1% can take 3-6 weeks to see proper results . My skin was already in good condition from using other products in Paula's range but this treatment has made a noticeable improvement to the fine lines and texture of my skin. I've not experienced any dryness or other side effects and have used this every couple of nights as per the recommendations. My only regret is that I didn't buy the bigger size but this will definitely be added to my repeat purchase list.